Will they grow up to be a cat lover, or a dog lover? Only time will tell, but with this fun pair, you don't have to decide. One foot is a playful puppy, and the other is a scrappy kitten. When they're together, conflict is almost guaranteed, so don't be surprised when the brawl breaks out. Intricate detail, and quality materials really capture these characters, and a soft fleece outer with a fluffy Sherpa lining makes them super comfortable. 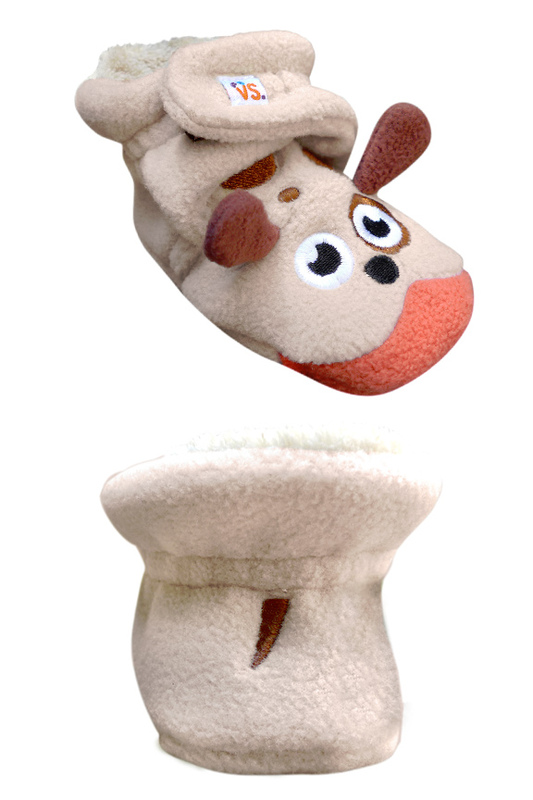 They come in a single 6-12 months size, and have an adjustable strap to keep them secure. The lightweight and breathable material will certainly keep those piggies warm, but they can be used for year round play as well. Let everyone take a break from talking about how cute your child is, and let them focus on their feet. Funny faces allow them to double as little puppets, and machine washable fabrics make them easy to care for. Keep their feet warm and happy. Fun and Funny. Baby will enjoy interacting with them, and everyone else will be pleasantly amused. High Quality. Superior materials and attention to detail result in great looking footwear that will last. Lightweight. The snugly fabric has a substantial look without being too heavy. Breathable. The thick material is super soft, but also able to breathe. Your child's feet will be comfortable in warm or cold climates. Comfortable. The fuzzy interior feels great, and the strap enclosure secures without causing discomfort. Snug. An adjustable strap secures with Velcro to adjust slightly for size. Your baby can kick, roll, scoot and play without them falling off. Prefer A Different Pair? We also have Owl Vs Mouse and T-Rex Vs Triceratops Booties for you to choose from. Choose your favorite rivalry, or collect them all! Sold on the concept and looking for more? Other battles can be fought with Predator Vs. Prey Mittens. They're specially designed for cold hands with attitudes. Order Yours Today! 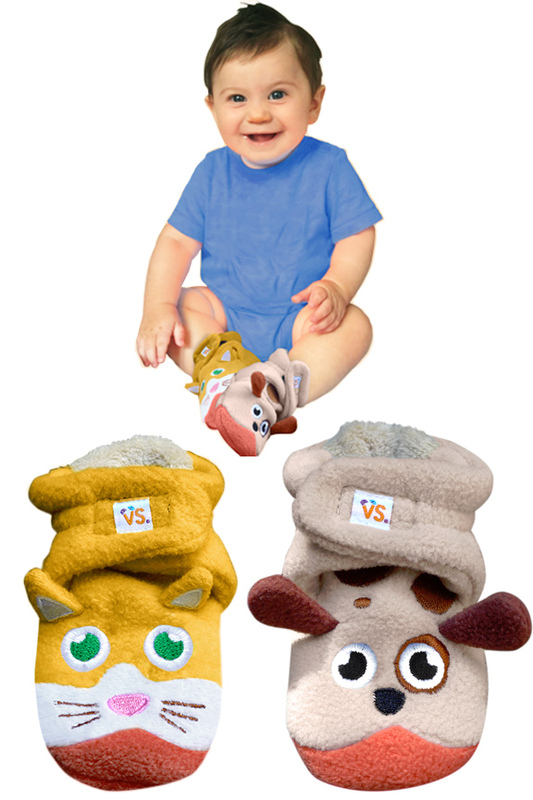 Predator vs. prey booties for infants. 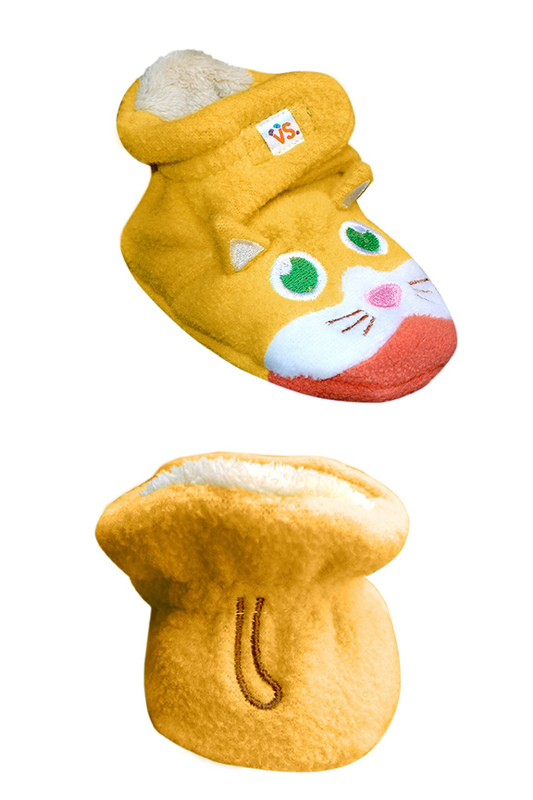 Cover their feet in warmth, and let them wear something almost as cute as they are. Order Yours Today! My daughter can take anything off her feet but these booties stay on. They are soft and warm and adorable. I wish they had grippers on the bottom as she is pulling to stand now and they are slippery but I figure I can always fix them up with some puffy paint.